Afraid that you are making Instagram mistakes? Years ago, I hopped onto Instagram like any other curious person to see what Instagram was all about, and quite quickly, I fell in love. Soon thereafter, I started wondering whether or not there were tricks to grow my following, increase my likes, and in any other way increase my presence on the social platform. And sure enough, it did, but many of those tactics are holes that have now been filled with Instagram realized people (including me) were hacking the system. Soon thereafter, I started wondering: if people’s attention is on Instagram, why can’t I use Instagram as a marketing tool, and use it to increase brand awareness, and build relationships? And if you’ve been using Instagram in today’s landscape, you know you can. It was just that not a lot of people were doing it. Fast forward some years and we’re here. Using Instagram for multiple years, I’ve learned plenty of mistakes that I’ve made on the platform and then stopped doing them. Because the truth is, the first step to avoid making mistakes is knowing that you’re doing them. It’s hard to stop doing something when you’re not realizing that what you’re doing is wrong. In this article, I am sharing with you 6 rookie Instagram mistakes I learned the hard way, from many years of trial and error, so you can avoid making them, too! This is a major thing that a lot of people has got all wrong. Close to everyone on Instagram who is using it as a marketing tool want to grow their followers. They want to increase their reach and skyrocket their likes. They look up some guide on the different tactics you can use to increase your engagement and followers. And what is wrong with this approach? Well, everything. Because when you only look at numbers, you forget about what it is that truly drives those numbers. And when you look at it that way, you realize that it all comes down to one thing. What is the reason people are going to tap ”follow” on your profile? To have your content in their newsfeed when you share something, right? But what if they don’t like your content when they come across your profile? They obviously won’t follow you. And what if you are operating within the dog niche, and attract people who are passionate about cats, what do you think will happen? If you are focusing on growing your followers, don’t look at the tactics which you can use to grow that number. Instead, realize that it is the content you share that is the most important part. And when you realize that it is the content that convinces people to follow you, your strategy for growing followers will look a lot differently, right? And the same goes for increasing your engagement. If you’ve been using Instagram for a while, you’ve probably realized that some posts get a higher engagement than others. And the truth is, it is not about luck, it is usually not about timing. It is about the quality of your post. If you share a higher-quality and more appealing post on Instagram, it’s obvious that that post will receive a higher engagement. What we can learn from this is something that I didn’t realize until a while, and that is that the single most important thing to growing your Instagram is your content. And it’s easy to get carried away, looking at the strategies, instead of looking at the foundation. In order to prevent spam, Instagram made the choice of not allowing clickable links in comments and post captions. Instead, originally, the only place for a clickable link was in your profile, but now, it has been expanded to Instagram direct Message and Stories (if you have more than 10K followers), too. The number of links you have is limited, to say the least, and this is why you should take advantage of them. If you build an audience for your brand on Instagram, and tempting people with your products, but then don’t give them a place where they can learn more, and to ultimately buy from you, you’re missing out on great opportunities. Your Instagram link has a tremendous power, and many brands have built their whole business on Instagram and having a link in their profile which leads to their store. When you have your audience at your fingertips, it doesn’t take a lot to convince them to also visit your site. And remember, traffic is the fuel of your website. Without traffic, your website is worthless. To add a link to your Instagram bio, go to “Edit Profile” and type it into the “website” box. A mistake that many people who are new to Instagram make is that they don’t optimize their Instagram profile, and set it up properly. They might begin posting incredible images, but if you haven’t set up your profile so that it is appealing and interesting, such as your bio, profile picture, website link, etc, there’s a risk that you’ll scare people away. You can’t build the walls when you don’t have a solid foundation. That’s facts. But moreover, you also want to ensure that the link you include is relevant. If your link takes your followers to a flower website, when you are a brand focused on cars, it will create a disconnect between you and your audience. The bottom line is, Instagram has the power of driving sales for your brand if used correctly. But if you aren’t using the link that is available to add to your profile, you’re missing out. Big time. A big Instagram mistake I learned the hard way when I first started was that Instagram isn’t a promotional tool for brands to shove their ads down their audiences’ throats. Yet still, so many brands are treating it just like it. The truth is, the way you build a large, engaged audience, which in turn leads to marketing results, such as sales, is not by shoving as many ads down your audience’s throats as possible. Instead, it is about realizing the fact that it is called social media for a reason. 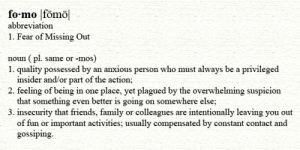 You’re obviously meant to be social. The problem too many marketers have, and the thing that makes them struggle, is the fact that the use Instagram as a promotional tool, not a relationship tool. And when you start using it just like that, it all changes. The way you build strong relationships with people is not by shoving ads in their face. It is by having consistent and genuine conversations and interactions with them. And when you do, they’ll become loyal supporters of your brand. Something that is tremendously valuable as a brand. In fact, some people will even go around telling everyone how amazing you are. 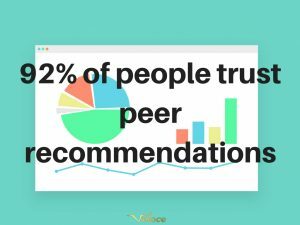 And considering the fact that 92% of people trust peer recommendations, it is something that is incredibly valuable to you as a brand. So how can you use Instagram as a relationship tool? Well, you should use every single way you can to engage with your audience. One of the most common Instagram mistakes I see brands make is they don’t respond to their comments. While it may seem like a small detail, it sends a signal, and it means that you’re missing out on an opportunity to start building a relationship. Because the thing is if someone talks to you in real life, would you look away and ignore them? Because that’s exactly what you’re doing when someone writes to you. People aren’t writing to you because they’re not expecting you to respond, are they? This is why the first step you need to do is respond to every single comment you get on your posts – even if a comment is just someone saying ”nice”, or giving you a thumbs up emoji. When people have taken the first step in engaging, you donating have to, so take the opportunity that is served to you. 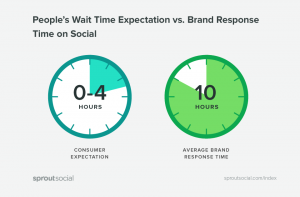 What’s more, since social media is quickly moving landscape, where information is transported at the speed of light, people expect you to respond quickly. Responding to comments isn’t the only way you can build relationships, though. In fact, you should take every single opportunity there is to engage with your audience and make them more loyal to your brand. And if there are no opportunities, you just have to create them. One of the many Instagram mistakes that I have learned over the years is that there are very few times when making your profile private is beneficial to brands. Sure, the private profile is tremendously valuable for private persons who don’t want to share their content with the world, but for brands, almost always, you should stay away from it. A theory is that when you have lots of followers, and then make your profile private is that people will get the Fear of missing out (FOMO), and wonder what it is so many other people seem to find interesting, and what it is they are missing out on. Nobody wants to feel like they’re missing out on something, but almost always, having your profile private as a brand hasn’t shown to be more beneficial than having it public. An important reason for that is that when you’re using hashtags when you’re tagging locations, etc, your posts won’t show up, thus both limiting your exposure, as well as reach. And a lot of people find accounts from hashtags, for example, but if you aren’t to be found there, you’ll get less exposure, and thus grow at a slower pace. What’s more, a lot of people come across a profile and just engage with it, but not follow it. When you have your profile private, though, they might just skip it all and move on instead. Lastly, people come to your Instagram page for customer service, and for asking questions. But if they first have to request to follow you before they can leave a comment on your post, sharing their situation, there’s a risk that a lot of people won’t have the patience for it, and instead go around telling everyone about their terrible experience, thus harming your brand. There’s no shortage of misconceptions about sharing content on Instagram. Now, I’ve already emphasized the importance of quality content on Instagram, but something worth noting is that quantity just isn’t going to make up for low-quality content. In fact, the single most important thing for Instagram success if quality content. No matter how much posts you share, quantity is never going to make up for low quality. Instagram has more users than ever. In fact, in September 2017, it was reported reaching 800 million active Instagram users. This also means that the competition of getting seen is tougher than ever. Because after all, according to Instagram, users share an average of 95 million photos and videos per day. Safe to say, the noise is huge, and this further increases the importance of quality content. Because the truth is, the way you stand out from the noise is not by sharing more content but more so sharing higher quality posts. This is more important than ever as a result of Instagram’s introduction of the algorithm. Previously, the posts in your feed were displayed in a chronological order, but since there was more content being created than what could be consumed, and Instagram users missed an average of 70% content in their feed, Instagram introduced an algorithm that would showcase the most relevant content to you. And this algorithm presents content in your feed mainly based on engagement. If you have engaged with posts from an account before, the algorithm is likely to present it in your feed. And what is it that drives a lot of engagement? When you share quality content, you’ll receive a higher engagement on your posts, and as a result of this, you’ll have our posts showcased in more people’s feeds. this is something that isn’t possible to do by sharing low-quality content. Consistency is crucial for Instagram success. A few times, I have taken a break from Instagram for various reasons, not for more than a week though. And what I have found is that your account loses momentum, and when you get back again, you’ll have a low engagement rate on the posts you share. What’s more, by being consistent, you show your audience when they can expect posts from you. If you are very inconsistent and even take multiple months of Instagram break, what do you think will happen? Your Instagram profile will have an opposite effect than what you created it for. In other words, it will harm you rather than help you. People will come to your profile, and they’ll see that you haven’t posted for a long time. The natural thing to believe when that happens is that your brand has gone bankrupt, or stopped operating. And as a result, people will shy away from buying from you. By being consistent on Instagram, you build up momentum, and more importantly, you make Instagram and the Instagram algorithm happy, thus making them favor your posts. There are tons of pitfalls and Instagram mistakes that you can make, and the first step to avoiding making mistakes is always becoming aware of the fact that you’re making them. These 6 mistakes are among the top most significant mistakes that I’ve found during my years on Instagram, and some of them are also the most damaging Instagram mistakes you can make, which can significantly harm your strategy, and prevent you from getting where you want to go, and generating the results you want to see from your Instagram marketing efforts. What mistakes have you made on Instagram? Would you add some mistakes to this list?